We are in, as President Bush used to say, Deep DO DO. The global deflation that has been growing for years has now taken hold. Commodities prices have crashed world wide and now global stock markets are starting to crash. If you do not understand deflation and know exactly what to do, you could lose everything. Before we get into proof of the coming deflation/depression, let me explain to you what is happening in the markets and what the future holds. The next wipe out will take $100 a barrel Crude oil to $10. Do not get caught up in the incredible spin. Oil is in vast over supply. It’s pretty simple. $100 a barrel oil made it damn profitable to invest in new oil exploration and oil recovery technologies. And it payed off big time. At least at first. Every producer and producing region of the world have vastly increased their output. Canada, who 5 years ago was a net oil importer, has become among the worlds top 10 oil exporters. The US is very close to becoming energy independent. What you need to understand, this is a global phenomenon. Global oil supplies are shooting to the moon. On the right is a chart reflecting that fact. Reality is the global deflationary slow down is reducing demand. At the same time, 5 years of the biggest investment in exploration and new oil field technology have greatly increased supplies and production. And the price of oil reflects that reality. 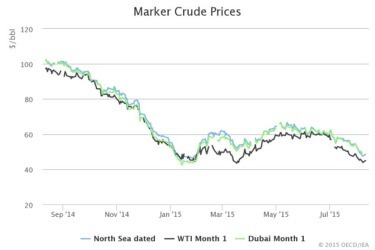 Look at the oil price chart on the right. As you can see on the chart, oil prices have dropped by half. What you need to understand is the biggest investors in oil were the banks. What they did in the housing markets (creating a bubble) from 2000 to 2007, they did in oil from 2008 to 2015. They were given trillions in virtually free loans by the treasury. And they did two things with that money they leveraged 100 times over. They invested in and manipulated commodities, especially oil. And they created the greatest stock market bubble ever. (more on stock market further down) In case you have not noticed, commodities and the stock market have all started to crash. Key word here, started. Because the commodities and oil market wipe out are far from over. In fact, the next leg down in oil is about to begin. 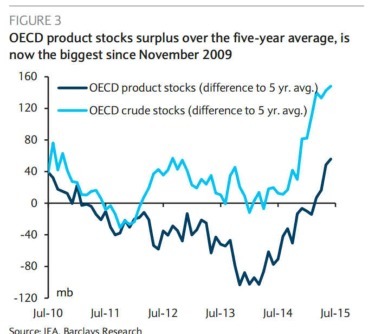 If you thought the over supply oil glut was bad. It’s fixing to get a whole lot worse. And here is why.. The Obama Iran Sell out will bring vast amounts of oil to market. Lifting Iran sanctions, besides letting Iran get nukes. And buying formerly embargoed Russian long range missiles. Also unleashes an oil export juggernaut. Iran’s oil exports plunged under the embargo and sanctions to under 1 million barrels a day. They have already let contracts and ordered badly needed spare parts. Which means they will be able to ramp up production quickly. We are talking about an increase of 3 million barrels a day in their exports. Bringing them to 4.5 million barrels a day. What most people don’t understand is Iran has vast oil reserves. Its crude oil reserves are ranked 4th and its natural gas reserves are ranked as the 2nd largest in the world. And Iran’s production has been shut in for decades. Funny what Wall Street forgets to tell you. Look at the map. It shows the locations of Iran’s existing vast oil reserves. But get this, a lot of potential oil rich land in Iran has never been explored. But there is more. Iran under sanctions could not get the spare parts and equipment for its oil fields. Exploration and new production came to a screeching halt. In other words, they are 20 years behind on their oil field technology. Production was cut by 2/3. Now that sanctions are about to be lifted, that will all change. They have already ordered parts they need to ramp up production. They also have inked contracts for oil field and drilling companies to come in. Which means another oil production star is born. Oh, one other thing. Iran has had a hard time selling what little oil it produced on the black market. They have stockpiled, mostly on tankers, 50 million barrels of oil. The day sanctions are lifted that oil will slam the oil market. It’s not rocket science. Oil is seeing an ever increasing river of product come to market. Wall Street and the bankers have failed keeping prices up. There is just too much supply. Every rally back is nothing more than a selling opportunity. Ten dollar a barrel oil here we come. STOCKS have started their fourth biggest decline in history. I have predicted AHEAD OF TIME and traded 3 out of the 4 of the greatest stock market wipe outs in modern time. The first great stock market crash was the 1929 wipe out. This gave us the great depression. The second was the 2001 tech wreck. Those of you who were with us at the time know we made a killing. The next great stealing of individual wealth by Wall Street was the 2007 housing wipe out stock market crash. And another great fortune was made. And the fourth is the one that just stated, the banker commodity/oil market crash induced, stock market wipe out. Everyone of these stock market crashes wipes out many people who did not have enough time to wait for a recovery. Unfortunately, this time the crash and subsequent depression will be like 1929. It will take 20 years or more to even begin a recovery. Most people who are trading today will never see their money come back. This next great depression, like the last one, will end up in all out war. Yes my friends, World War II was a direct result of the poverty and desperation brought on by a world impoverished by Wall Street. Already for most of the third world, they’re down the road into their commodity induced poverty and depression. Come to think of it, most all commodity based economies are in the dumpster. Wall street shot ALL commodity prices to the moon and distorted national economies. It was easy to be lured into the trap of making investments and borrowing money based on the artificially high commodity prices. Now that all commodity prices have crashed, it’s hell to pay. Australia has seen their currency crash. Iron ore, copper and the minerals they used to sell to China are trading for half the price. The billions and billions of mine and port investments are now colossal money losers. Canada’s oil and mining industries are devastated and their economy is in a recession. The good times are over. Same thing in Brazil and Peru, all the mineral, oil and agricultural exporting nations are the first to fall. Now it’s spreading. Who do you think manipulated commodity prices to the moon? You got it, our Wall Street banking whores, flush with bailout money from the US, European and Japan’s central banks. They used those funds to manipulate commodities markets and stock markets the world over to the moon. They then loaned players the money to finance and expand their oil and commodity businesses. They also provided the loans and the capital for the stock market manipulations. All commodity prices the world over are crashing and all stock markets the world over have started to crash. Can’t you see it? I defy you to find me a commodity or stock market the world over that is up for the year. Don’t be fooled by the wall street self serving spin. This is not a correction, not a pause that refreshes and certainly not a buying opportunity. This will go down in history as the biggest commodity and stock market wipe out the world has ever seen. There will be no recession this time, no great recession and bail out. But the biggest depression the world has ever seen. If you do not understand a deflation and do everything right, you will lose everything. And I mean EVERYTHING. If you would like to hear me rant and rave about all this, click here.